Suckers Rally - What Does It Mean? 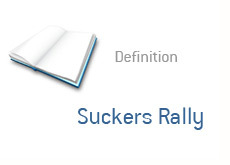 What is a "sucker's rally"? What is the definition of a "sucker's rally"? The dictionary defines a "sucker" as one who is "easily deceived or duped". In a "sucker's rally", investors send the markets higher as they clamor to buy stocks. Unfortunately for them, the rally proves to be short-lived, as their reasons for buying turn out to be incorrect or ill-timed. The markets have recently exploded off of their lows that were set earlier in the year. Many investors re-entered the market, certain that the US economy was starting to turn a corner and that the markets would be heading higher as well. The rally has since died out, which has led many to question whether this was indeed a "sucker's rally". Those who believe that this was a "sucker's rally" point to the fact that there is no real evidence that the economy is, in fact, improving. They point out that unemployment numbers are still rising and economic activity is at a virtual standstill. If the markets sell off from this point, then this most recently stock market rally will in fact end up being a "sucker's rally". A "sucker's rally" is usually based more on hope and optimism, and less on fundamentals.